I like the Philippine Independence Day simply because I don't have to go to work. I know we are commemorating the declaration of our independence from Spain (1898) but I vaguely remember the details that my History professor taught me in high school. I am not patriotic and nationalistic. 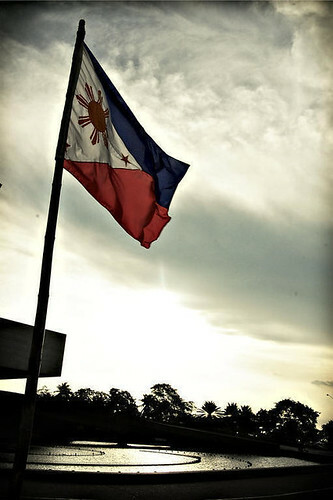 But, I am proud to be a Filipino. I have long accepted my curly hair, flat nose and fair skin. I have respect for our heroes who have died for our freedom. Like you, I am proud of Efren Penaflorida, Manny Pacquiao, Mark Paragua, Charice Pempengco, Lea Salonga, Arnel Pineda, Ben Chan and others who have made us proud to be Filipinos. A few years ago, my colleague shared with me a book that made me realize that I do not need to die, be an athlete or be good in science or arts to contribute to the "well-being" of our country. We just have to stop blaming our government and do our share to help our country. Follow traffic rules. Follow the law. Whenever you buy or pay for anything, always ask for an official receipt. Don't buy smuggled goods. Buy local. Buy Filipino. When you talk to foreigners, speak positively about us and our country. Respect your traffic officer, policeman and soldier. Do not littler. Dispose your garbage properly. Segregate. Recycle. Conserve. During elections, do your solemn duty. Adopt a scholar or a poor child. Be a good parent. Teach your kids to follow the law and love our country. Let us teach these little things to our children and live by example. I think if we do all this, our country will be a better place to live in. In your own little way, what do you do to help our country?